South Australia got the best of the start but were overhauled by Victoria by the 500 metre mark. The Victorians suffered strong challenges from NSW but went onto win convincingly even though the margin was only 2.1 seconds. Peter Antonie led throughout but was under constant pressure from Richard Powell. Peter became the first person ever to win Interstate Eight, Sculling and Lightweight Four Championships. This was another good race with SA leading from the 500 metre mark and being pressured by both Tasmania and Victoria throughout the race. Queensland gained an early lead which they did not surrender. Victoria and NSW fought out the second place keenly only 2.4 seconds behind Queensland. This event became a coxless event this year. Victoria led for 1500 metre before being overpowered by NSW over the last 500 metres. NSW won in the end by a comfortable margin of 4.8 seconds. Jenny Luff led from the start and built on her margin to finish 9.8 seconds in front of Sandra Harvey in second place. Victoria led from the start and consolidated their lead for the balance of the race being never threatened. SA dominated this race from the start and finished a commanding 16.7 seconds in front of Victoria in second place. 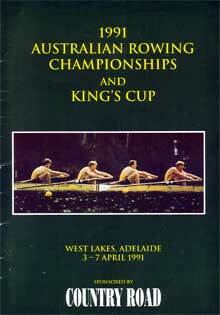 The SA crew members went onto being key rowers within Australia.